Remember dating in your twenties? It sucked, right? All the insecurity, bad decisions and ‘what if I never meet anyone? !’ panic. Now, in your late thirties and beyond, things are different. You are different. You know yourself better, you know what your priorities are, you’re done pretending, and you know what bulls**t looks like. Which means, it can be a heck of a lot of fun, if you have the right headspace, and have done the healing required to be whole. step one: don’t be ageist. So much of how we define ourselves , and thus end up silo’d, is determined by which age-box we tick off on a form. It’s a gravitational pull towards the norms. When we’re in the market for a relationship, one of the first questions friends ask is ‘what is your age range’. Typically, it’s within a few years either side of our own age. Unless, you’re a man, in which case, no matter what your age, you prefer 24 year olds. (To be fair, that only reflects men on OkCupid.) Truth is- and, ask any woman over 35 and they’ll have the stories to back it up – men are not afraid of dating older women, not as a weird fetish, but because they recognize what they bring to the table – strength, experience, wisdom, perspective. Don’t rule out the younger man, that would be ageist. Finding love after you’ve had some serious life and relationship drama is different than it was fifteen or twenty years ago, when you didn’t know what you know now. So, don’t expect to approach it the same way. It might be a more serious consideration, involving kids, or strict boundaries, or some trust issues you’ve acquired. On the other hand, it might be a post-divorce taste of freedom that has you YOLO-ing all over town. Regardless of what you tell anyone else, be honest with yourself. Shockingly (to me, at least) is that the average time for remarriage after a split is three years. That doesn’t seem a like a huge amount of time for healing, regrouping and figuring yourself out. Maybe not surprisingly, the second-marriage divorce-rate is higher than the first timers. The lesson? Take all the time you need. Meditate, reconnect with girlfriends, make a life-list or a vision board and focus on what you really want for your life with or without a partner. For many women, this is a time in life when they pivot; they find their true north and put their own happiness back at the top of the list. This is incredibly important. As flight attendants have taught us, you have to put your own oxygen mask on before you help anyone else. 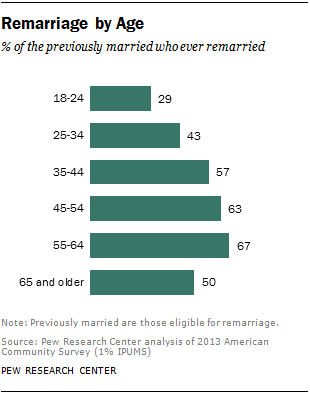 According to the Pew Research Center remarriage is still very popular, despite it’s very bad track record. The average age of divorce (erm, the first one) is 30, but that doesn’t make everyone gun shy. There’s a glut of couples on their second marriage between 35-54, and how about the huge number of couples 55+ tying the knot. The wedding industrial complex is alive and well. I’m not sure I’d call dating at any age ‘glamorous‘ (shout out to goop, but, no) considering the very high chance of endless first-date small talk, and, mismatched ideals, but, one thing I know is true, many women meet their soul mates in their forties, and have fulfilling, rich and rewarding relationships because they know themselves a lot better than they did when they were 24, and the ‘happy ending’ we’re looking for is centred on realistic goals and authentic connection, which may or may not include marriage. Either way, you’ll be good. What has your experience been dating in your forties? Spill! At some point in our lives, we need to take a risk. Instinctively, you likely know the one I’m talking about for you. THE risk. It’s the one that opens you to the judgment or opinion of others, where we push through the fear and use our voice; when we walk away for the last time. The one where we quit our jobs to pursue something less secure. I’ve done all of these things, for the record. But, this one is the scariest for me. This one is the closest to my heart. It’s letting you see me. And what if you don’t like what you see, or worse, don’t care? Here’s the great thing about turning forty: in your forties you stop making decisions based on what other people think; rather suddenly, your own opinion about your life and your choices is the one that matters most. Forty makes you braver than you’ve ever been. It’s a refreshing blast of ice water in your face; it’s a swagger earned only through experience. It’s a fresh start. Subscribe to our website to be the first to know when the podcast launches. Click here to send us your questions and ideas about who you’d like to hear featured on the podcast, and what topics you’d like us to discuss. How do we talk about something if we don’t have the words? This difficult question has presented itself to me before I’m half-way through my first coffee. I’m standing in my socks, staring at a wall of sharpie-covered sticky note chaos in my office. It’s an early winter morning. I’m mentally willing the pastel cloud of research staring back at me to organize itself. I’ve spent years investigating the topic of women turning forty from every possible angle. The notes are sorted into colour-coded categories that I’ve been digging into on the topic of women in their forties – Neurology, Biology, Psychology, Sociology – with dozens of sub-headings mixed in. It had become a point of practicality. I needed a shorthand to describe what I was doing. Without exception, whenever the topic of my research came up, any woman over 35 and within earshot perked up, looked me straight in the eyes, and whisper-pleaded with me to publish my book before their fortieth birthday. Turning forty was obviously on their minds, and despite a life that looked really good on Instagram, they were having a small (or in my case, large) freak-out. At the very least, they had some legitimate questions about life after forty. are so much to so many in our lives, yet struggle with our own identity. Many women in their late 30s and early 40s feel profoundly unfulfilled, or disillusioned with the life they’ve built, irrespective of what it looks like on the outside. It’s no wonder we lack a meaningful language to talk about this stage of life. Our words are borrowed from our younger selves, and more often from the media messages that we willingly and unwillingly absorb, and have for our entire lives. There is no lack of bite-size reading material on the subject of turning forty. Most of it social media clickbait, full of tired, patronizing advice, or lists of 40 Things To Do In Your 40s! Or, the truly gag-inducing Forty Is The New Twenty genre. But, what I have found, despite research chops honed in national newsrooms, hundreds of conversations with scientists, psychologists, women (and men) of all ages and countless magazine articles and research papers is this: a common language to describe the era of your forties does not exist. In fact, serious study of women between the ages of 36-50 is hard to come by. For decades, if not millennia, women in this age bracket have been dismissed as less than noteworthy in scientific terms, except for very specific exceptions, such as fertility. But, finally there are signs of change in that gross overgeneralization.Research in the fields of biology, psychology, neurology, is opening new conversations and revealing valuable data. Which brings me to the name of our new language, and blog – Fortyology. Forty, refers to the age bracket between 40-49, and ‘ology’ is the study of. Yep, that’s me. World’s first Fortyologist. Fortyology is the umbrella under which we will explore data, stories, sage advice and culture of being forty(ish) in a Boomer – Millennial world. I’ve spent several years researching Fortyology from a place of passion, science journalism, self-interest and above all, the desire to share this with you. It’s no coincidence that I’ve also been embedded in the world of my forties and have learned much from my own experiences, research and wisdom from those who have come before. I can’t wait to share this language and the world of Fortyology with you, and for all of us to expand our vocabulary. Leave a comment, or send an email to share your thoughts on the language of forty. I'd love to hear your thoughts on this! Please share the post, subscribe and leave a comment.